"This is probably the easiest recipe that I've ever come across, but it's one of my best-tasting recipes, too! It's very important that you keep the dip warm while serving. You can also heat it in a microwave oven." We love this recipe. It's a staple during football season. I tend to use velveeta, and I use canned diced tomatoes and chilies together. It is perfect. YUM! Used velveeta, rotel with tomatoes and green chilis, and Chunky brand chili with no beans. Got rave reviews! I make this recipe with a block of low fat cream cheese instead of processed cheese. Comes out great and is a huge hit at my house! i used this to make rotel cheese dip so i didnt use the chili and used salsa. will go good with enchiladas and rice. Delicious! A definate make for Thanksgiving appetizers! We made this for a trial run and all agreed that this recipe was 'in' for our Thursday feast. Thanks! 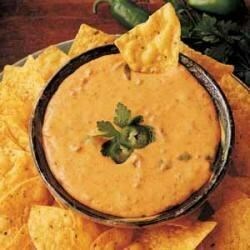 I have been making this Chili Cheese Dip for years. Its always a hit!